Prepare chicken by cutting off the wing tips. In a small bowl combine the remaining ingredients. Coat the chicken with the mixture inside and out. Push the chicken together so legs and wings are set back. Place the chicken breast side up in a shallow baking dish and set it in the center of the oven. Bake for 25 minutes, then lower temperature to 325 and cook for an additional 45 min to 1 hour (depending on size). Remove from the oven and let it rest for 5 minutes before you cut it. Carve the chicken and serve with rice a side vegetable (artichoke, asparagus, green beans, etc.) You do not need a saucy or flavorful vegetable as the cumin flavor from the chicken will infuse everything! I loved the smell of the cumin baking - this was a wonderful and very easy dish for me. The kids ate it and the leftovers were great. Highly recommend. This is my personal favorite baked chicken recipe. I love the bold flavor and it's even better the next day. Despite all of the pepper, our kids love this too! I am a cumin chicken fan!! It was so easy to prepare and simply delicious! Even as good the next day! My husband thought this was the best roast chicken he has had. I brined the chicken first, which I do with most of the poultry we eat. Because of the brine I did cut the salt back to 1/2 Tbsp kosher salt. Tried this recipe and it came out quite well! Cooked it for my wife, son and I. We all loved it. My son is 3 and ate every piece. The Pepper doesn't have an overly strong pepper taste so was fine for the little sensitive mouth of a 3 year old. This was incredible. I was amazed at how the cumin infused the whole bird - we did a cut-up chicken instead of a whole bird which allowed me to really rub the spices in better. Also - for extra fun, I ground up the cumin seeds in a mortar and pestle and that was our ground cumin - talk about potent flavor! Thanks for another great recipe. This was a very tasty and very easy recipe. It will become part of my everyday recipes. My husband loved it and we both enjoyed the leftovers. That being said, I would not hesitate to serve this chicken to company but I wouldn't tell them how easy it was. The scent of the cumin and wine as it was roasting was wonderful. For just the two of us (empty nesters), I substituted chicken legs instead of a whole chicken. I ate a piece of it cold the next day and it was still very good. I think this chicken could be taken cold to a picnic and I am planning to try that out at our next family reunion. I am also thinking about marinating the chicken for a few hours next time. Thanks for another great recipe. I am adding this to my review. I have now made this recipe several times and I have made it for company. Even though it is quite simple, my guests loved it and gave lots of compliments. That's always nice! My husband looks forward to it and enjoys the leftovers in his lunch the following day. I usually marinate the chicken for a few hours and that works well. I have reduced the pepper in half but everything else is the same. I use chicken pieces (breasts and legs) instead of a whole chicken and it turns out fine. This is a great recipe and I highly recommend it. So glad you enjoyed it Linda. Thanks for the thoughtful and thorough review! I made this recipe this week.. I used chicken breast only, so adjusted the amount of spices, it was very good! I love the flavors...the chicken was so moist.. I will be using this spice combo frequently on my chicken breast. Thanks for sharing! Glad you enjoyed it TobeNourished. I haven't tried with just a breast, but sounds like it was tasty. Thanks for sharing the review! I love cumin flavour and this chicken looks divine to me. Thanks. Hope you enjoy it, womanwisdom. Please update your review if you try it and like it! the picture of recipe is not that great. the recipe sounds like something i would try. We found this recipe to be pretty bland. Not a hit at my house. I like chicken and so is my kid. This recipe is nice to try, tho it will be a recipe that I would need time to make. I'm ready 2 try this recipe. very impressed w/ all the comments. Thanks so much 4 all ur wonderful recipes, John. This looks absolutely delicious. Cumin is a great spice (even though many can't stand the smell) that adds a very distinct flavor. I think this would be good a recipe to use with some bone-in, skin on chicken thighs! You're on target, Jason. We usually make this with a whole chicken, but we've made it with just bone-in thighs before and that is also delicious! Is it possible to use boneless chicken? perhaps even marinate it overnight? Give it a try and let us know how it is. I don't see any reason why that wouldn't taste good. I'm going 2 try it also. John, love this recipe!! I can't wait to have friends over to try it!! It is even great the next day! Thanks, for sharing!! John, I made this last night and we all loved it. Great taste. I had the famly vote on this recipe or my thyme one and it was called a tie. I think next time I'll experiment and use both thyme and cumin, and then try out the high heat method on it and see what happens. Makes my mouth water. I rarely cook with cumin so this will be a treat to try. 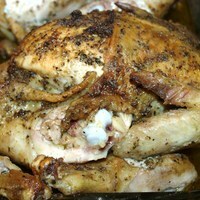 Just came back from the grocery store and now wish I bought a whole chicken...this looks really good!